Reigning Turkish Airlines Euroleague champion Olympiacos Piraeus stormed into the playoffs and took out BC Khimki Moscow Region with a 79-70 victory at the Peace and Friendship Stadium on Thursday night. Kostas Papanikolaou turned in a masterful evening with 21 points on 6-of-6 three point shooting plus 12 rebounds and 2 blocks to pace the winners, who will have home-court advantage when they meet Anadolu Efes Istanbul in the playoffs. 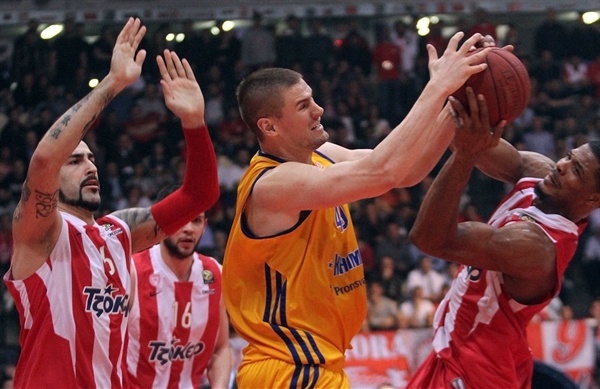 Olympiacos finished second in Top 16 group F with a 9-5 record, while Khimki bowed out at 7-7 and in fifth place. The Reds first took charge with a 14-2 run bridged the first and second quarters. Olympiacos continued piling it on as Georgios Printezis boosted the lead to 45-30 with two minutes left in the second half. James Augustine revived Khimki as it rallied to within 45-38 at the break. Big minutes from Zoran Planinic in the third quarter completed the comeback at 56-56, but Khimki never took the lead. Papanikolaou helped keep Olympiacos in front with two more triples before his coup de grace – a four-point play to restore a double-digit lead with a little over four minutes remaining and Khimki never got closer than 7 the rest of the way. Vassilis Spanoulis added 15 points and 5 assists and Acie Law tallied 10 points and 8 assists for the victors, who also outrebounded Khimki 43-36. Augustine led Khimki with 19 points and 8 boards, Paul Davis scored 13 and Planinic finished with 12. K.C. Rivers sank a tough pull-up jumper in the lane to open the scoring. Spanoulis got the hosts rolling with a three-pointer. Khimki, unfazed by the atmosphere, got going and boosted its lead to 3-7 on a Rivers triple. Vitaly Fridzon added a triple to make it a 5-point game. Acie Law showed off his speed for 5 quick points – including a nifty layup-plus-foul – to trim the deficit to 9-12. Davis scored twice, but Papanikolaou pulled up in transition and buried a three. Law got the ball to Josh Powell on a broken play for a slam and Pero Antic corrected a Spanoulis miss to tie it at 18-18 through seven and a half minutes. Powell put the Reds ahead and after a pair of Spanoulis free throws capped an 8-0 run, Planinic could only bring Khimki within 22-20 at the end of the quarter. Dmitrios Katsivelis nailed a triple and Kyle Hines went through Rivers for a basket-plus-foul as the hosts boosted the lead to 8. Davis hit a jumper to try to recharge the visitors. After forcing a 5-second violation, the Stratos Perperoglou scored his first points to make it 31-22. 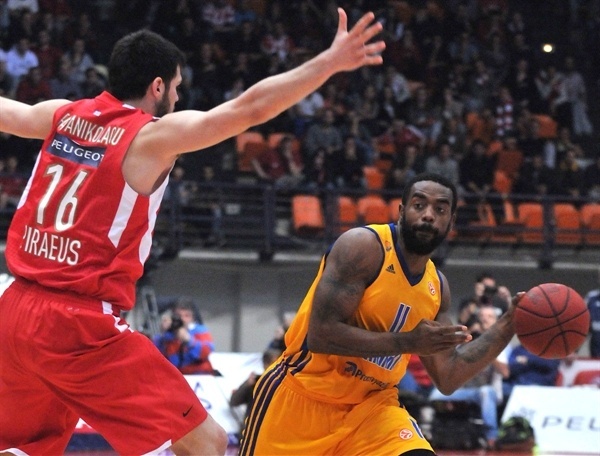 Despite a pair of Augustine free throws, Spanoulis knocked down a three to give Olympiacos a double-digit lead. The teams traded buckets until Georgios Printezis nailed a triple to put the hosts up 43-30. 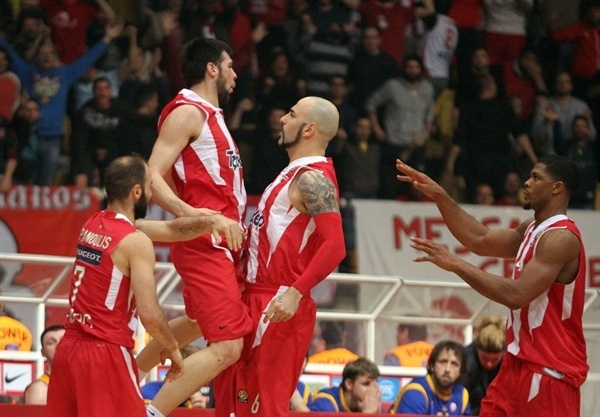 A Perperoglou block led to a Spanoulis layup as the Olympiacos faithful roared in approval. Petteri Koponen answered from downtown. 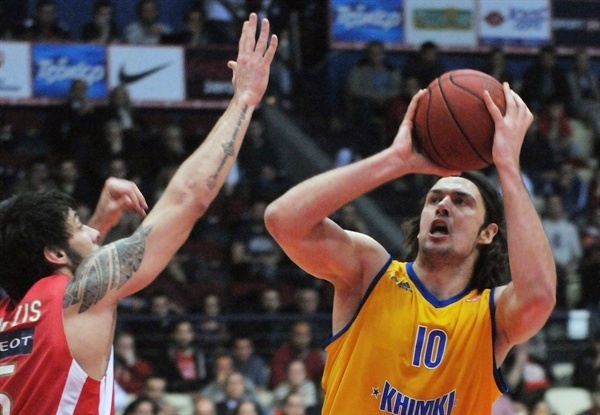 Before long, Egor Vyaltsev free throws and an Augustine slam revived Khimki. Augustine added a free throw to bring Khimki within 45-38 at the break. Koponen opened the second half by cutting the Khimki deficit to 5, however back-to-back Papanikolaou triples got the stadium rocking again. Khimki did not lie down and Augustine scored twice to make it 53-46. The teams continued to trade baskets with the Reds keeping control, but Khimki staying within striking distance. Planinic took charge with a pull-up three-pointer to close the gap to 55-51. A three-point play by Davis silenced the crowd as the lead was cut to a single possession. After an offensive foul on Davis soon after made it 4 on the big man, Planinic knotted the game at 56-56. Spanoulis put the hosts back on top with a free throw before Papanikolaou drilled a three. Planinic split free throws to make it end the third quarter at 60-57. 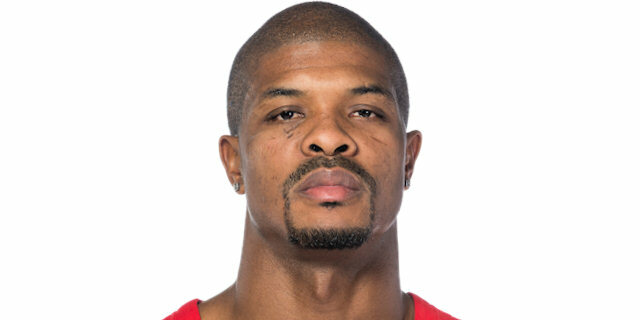 Hines went through Kresimir Loncar for a basket-and-foul – though he missed the free throw – as Olympiacos maintained a slim lead. An offensive rebound from Powell set the stage for Papanikolaou to send in his fifth three-pointer of the night, 67-59. After an Augustine basket, neither team was able to convert on offense for the next three minutes. The shot that may have sealed the game was a Papanikolaou triple from the wing – and the foul that came with it. That made it 71-61 with a little over four minutes to play. 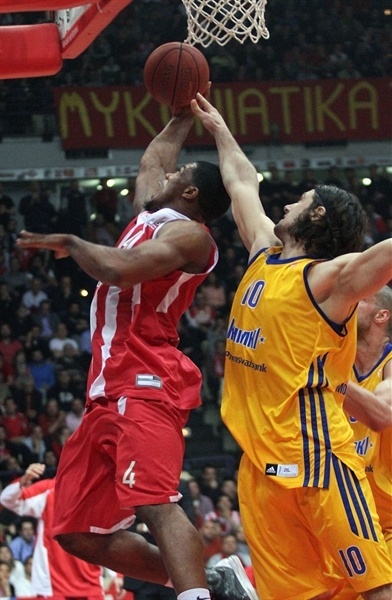 Augustine ended the Khimki drought, but Papanikolaou set up Powell inside as Olympiacos rolled on. From that point, the hosts matched Khimki almost basket for basket and Khimki never got closer than 7 as Olympiacos moved on to the next stage and sent Khimki home for good. 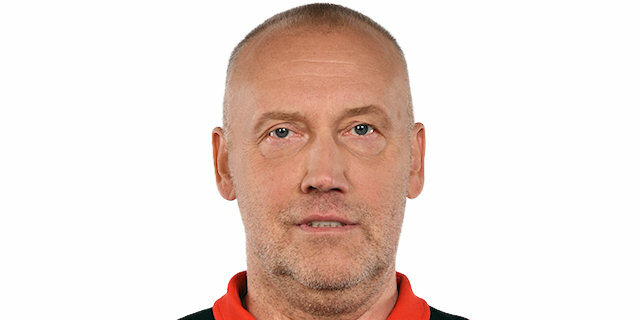 "It was a very crucial and an extremely difficult game, because Khimki has the best frontline and the best creator in the Euroleague. The are very good in the post up play, while Zoran Planinic dished 13 assists in the game we played there, but tonight he had only four. We fought for forty minutes, we outrebounded them and that was a main factor to win the game. 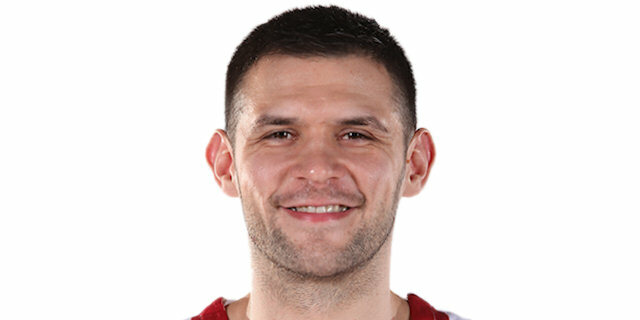 Kostas Papanikolaou had 6 for 6 from the three-point range, but I appreciate more his rebounding double digits. I am very enthusiastic to make it to the quarterfinals and we feel that all our efforts are paid off. It is not fair for that team to be compared to the last season team. Let’s compare it at the end of the competition with the previous Euroleague reigning champions and what they did in the next season. Now we have to concentrate on the first game vs Anadolu Efes. We have to go step by step and not counting what happened in the regular season, where they beat us easily and we defeated them the same way. I don’t count a lot on the home court advantage, it is not the main factor. The 2012-13 Top 16 is a case study to be discussed in the future." “Congratulations to Olympiacos for their victory and qualification to the quarterfinals. It was a good game, but we missed a lot of open three-pointers and they outrebounded us. But this is sports, a team wins while a team loses. We spent a lot of energy, but this is not an excuse. Papanikolaou killed us as he was unstoppable and sank six three-point shots." "It is a big win and now we will have the opportunity to defend the crown we got in Istanbul. Tonight we played good defense and remained focused for forty minutes. Anadolu Efes, our next opponent, is a very talented team, but I am optimistic that we will take a Final Four berth. The key points to make it is to defend the home court advantage and play tough in every game, either home or in the road ." "It’s great. Making the playoffs was our goal for this season and we are very happy. We played a great game; a great defensive game and a great offensive game. I am very happy that I helped my team win. It is all about teamwork. What counts and what matters is what the team does at the end of the season. "